Armament Research Services is proud to release the first in a series of long-form ARES Research Reports. Authored by Yuri Lyamin and N.R. Jenzen-Jones, “Improvised Employment of S-5 Air-to-Surface Rockets in Land Warfare” aims to provide a brief history and technical appraisal of a battlefield phenomenon which has received little attention to date. Below are some extracts from the publication, which can be read in full here . A limited contingent of the 40th Army of the Soviet Union stationed in Afghanistan in the 1980s developed what appears to be the first documented improvised system employing S-5 rockets in the surface-to-surface role. Although there was no shortage of artillery and close air support for Soviet troops, these capabilities were not always immediately available in the mountainous parts of the country (Włodawskie, 2012). As a result, some 40th Army units mounted additional light weapons, including rocket pods, on trucks, infantry fighting vehicles (IFVs), and tanks in order to strengthen the unit’s direct fire support capability. 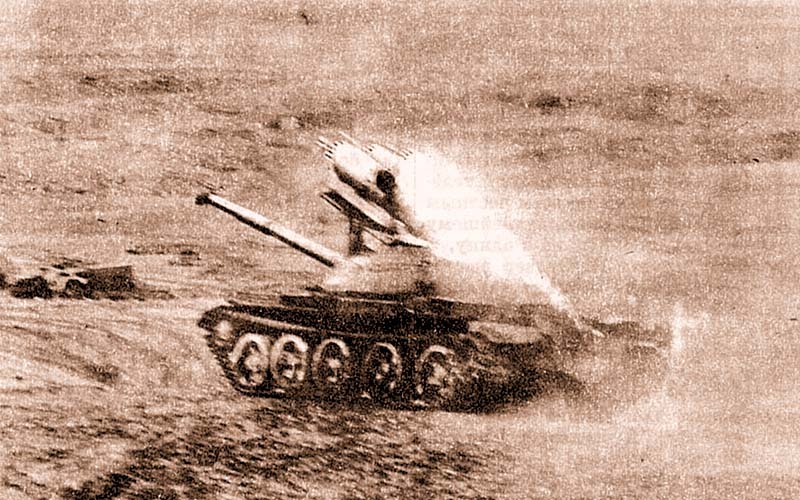 Rocket pods for S-5 rockets featured prominently in such conversions, with as many as three UB-32-57 launchers being mounted on a single T-62 main battle tank (MBT) in some instances. Soviet T-62 MBT in Afghanistan in the 1980s, with three UB-32-57 launchers mounted on an improvised platform above the turret (credit: Herald of Mordovia). 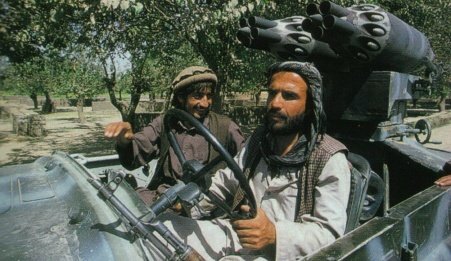 Another conflict where such improvised weapons became widespread was the Afghan civil war in the late 1990s and early 2000s. After the loss of Soviet military aid, the overthrow of the Najibullah government and the subsequent struggle for power between different factions saw the Afghan National Air Force fall into almost total decay (Haulman, 2012). Vast stocks of aircraft armaments, including S-5 rockets and their associated launchers, were repurposed for land warfare. Mostly mounted on light vehicles in the ‘technical’ configuration, UB-16-57 and UB-32-57 rocket pods were employed in both the indirect and direct fire support roles. Improvised rocket system based on UB-16-57 launchers in Afghanistan in the late 1990s or early 2000s (credit: armourbook.com user ‘Katran33’). 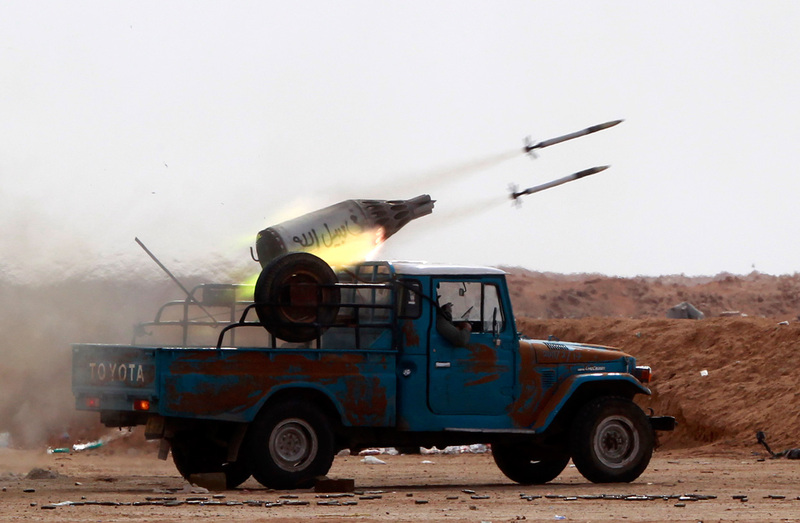 Although improvised systems firing air-to-surface rockets had become commonplace in some armed conflicts of the 1990s and early 2000s, it was only during the civil war in Libya in 2011 that these weapons became one of the primary systems used in many of a conflict’s land battles. S-5 rockets, among others, were used with a variety of improvised systems, ranging from single-barrel man-portable rocket launchers to UB-32-57 rocket pods mounted on pickup trucks. 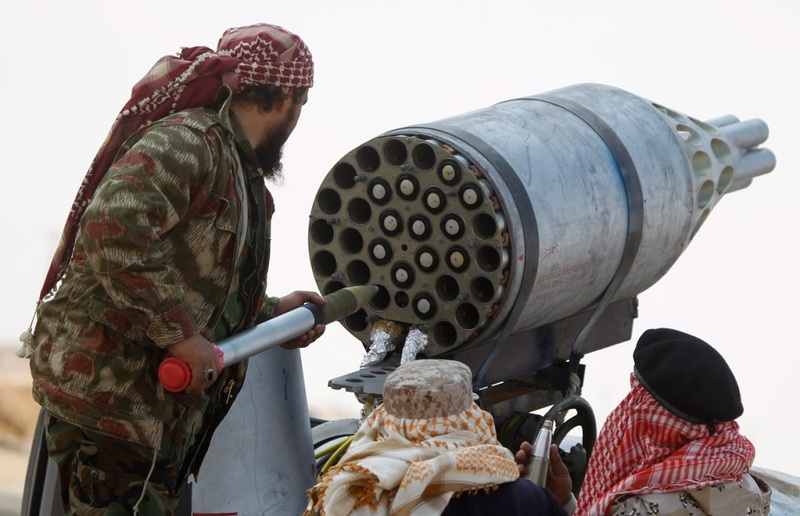 Rebel combatants load a UB-32-57 rocket pod mounted on a pickup truck at the front line along the western side of Ajdabiyah on 19 April 2011 (credit: Reuters/Amr Abdallah Dalsh). You can read the full PDF report, here. Stay tuned to The Hoplite for future releases in the ARES Research Reports series, and other publications. You can follow ARES on Twitter, here.